My dad’s basement is a treasure trove! I swear the man has never thrown anything away. 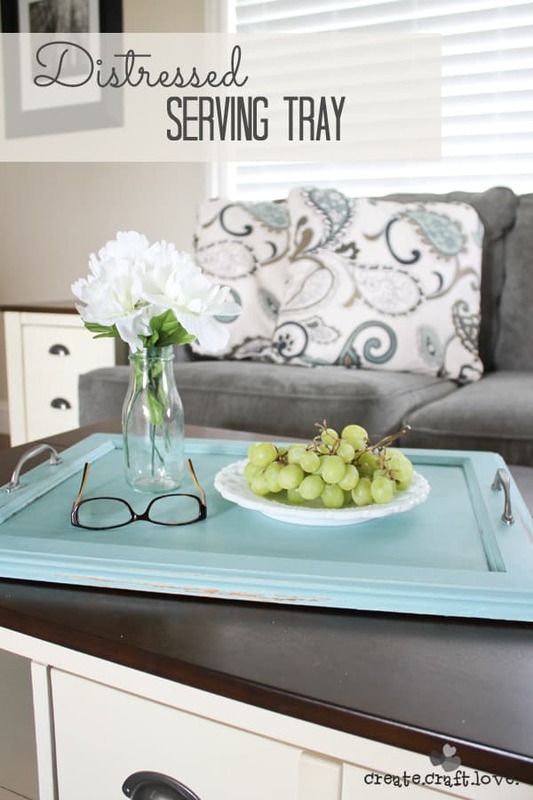 As a DIY fanatic, it’s like going to the thrift store every time I visit! I came across some of our old kitchen cabinet doors on my last trip north. I had a couple of different ideas swirling around in my head but once I started decorating the new house, one specific idea came to my head. I had to have a Distressed Serving Tray. 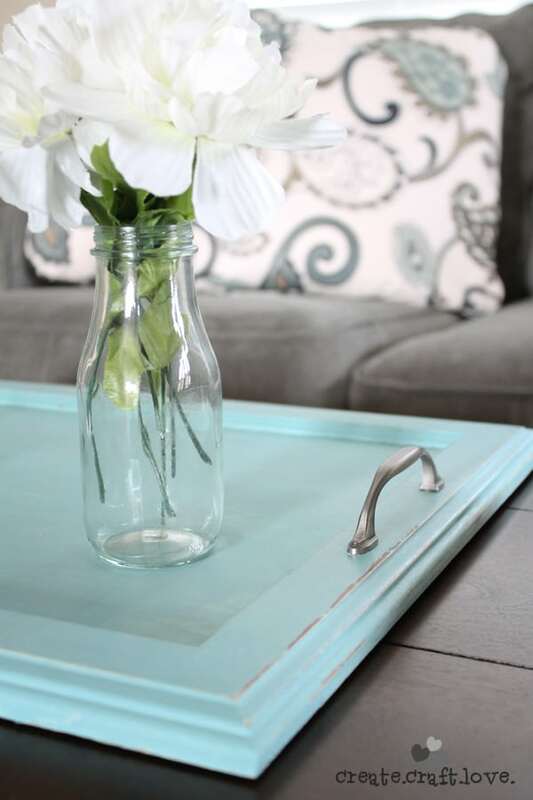 I don’t know why, but I thought it would look so pretty on my coffee table! 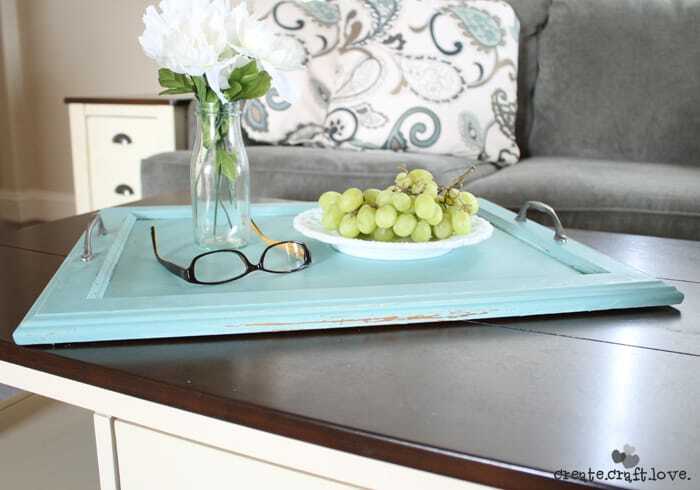 To create your own Distressed Serving Tray, here’s what you’ll need. 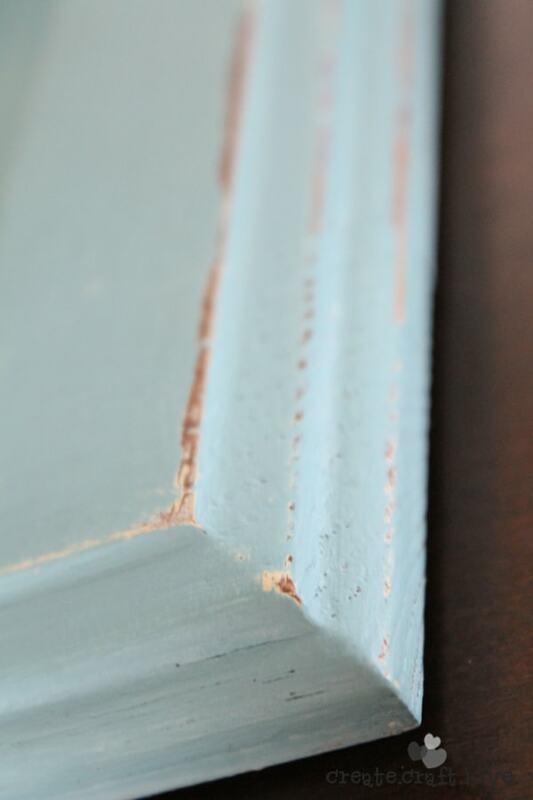 I began with an ugly old kitchen cabinet door. 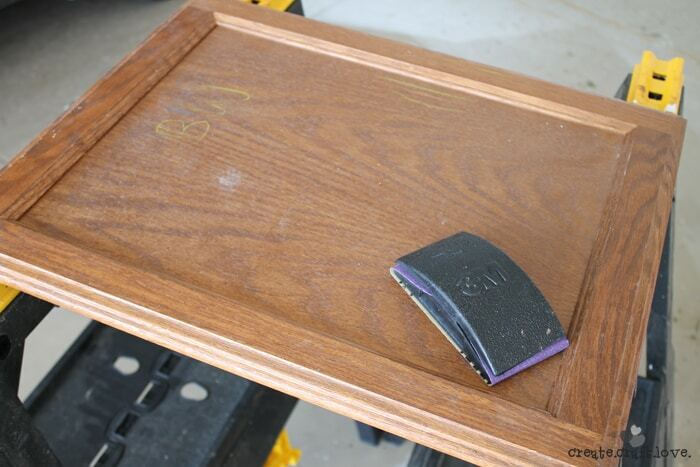 I wanted the tray to look like it had been painted several times to show its age. 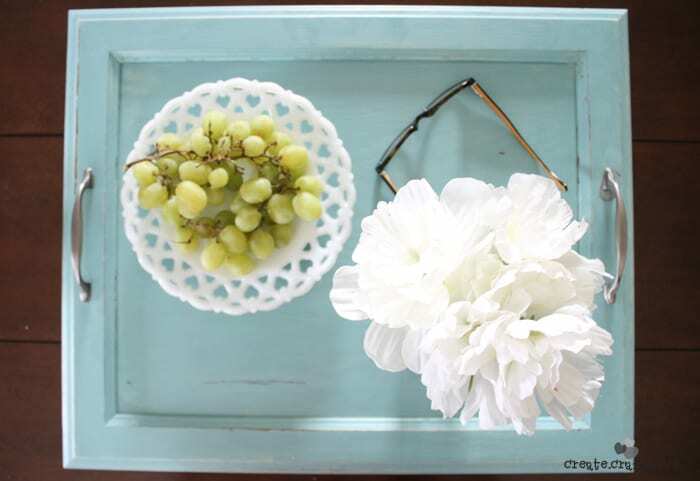 I painted a layer of cream Chalk Paint® first. What I love about this paint is how thick and easily it goes on! This is just one coat of paint! 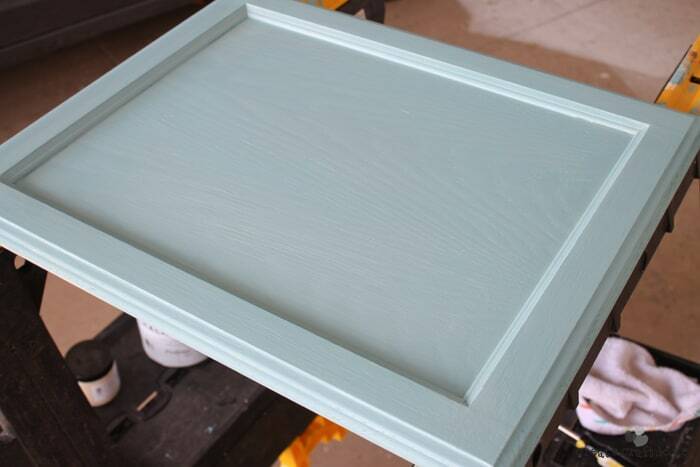 Allow first coat to dry. 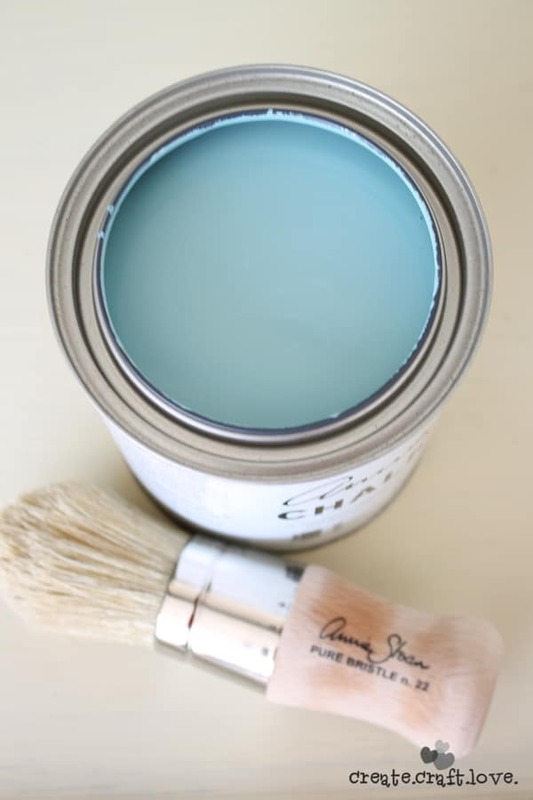 Next I opened up my can of Provence colored Chalk Paint®. Isn’t it exquisite? PS – that is one of my favorite pictures ever! I applied the next color over the cream. I wanted this top color to look a little more “finished” so I applied two coats. Once the paint has completely dried, it’s time to wax and distress! I have to admit, I was a little skeptical of how well this rounded pure bristle wax brush would work. Let’s just say it is totally worth it! The angle of the bristles allows you to get in all of the little nooks and crannies! A little wax goes a long way! I hardly made a dent in it! 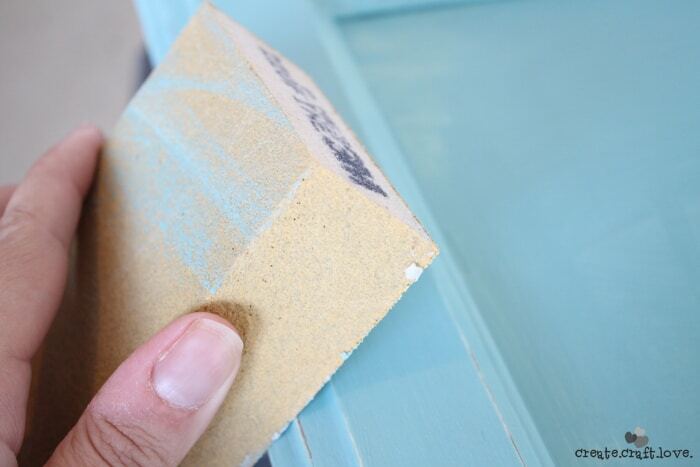 Apply a layer of wax to the entire cabinet front. 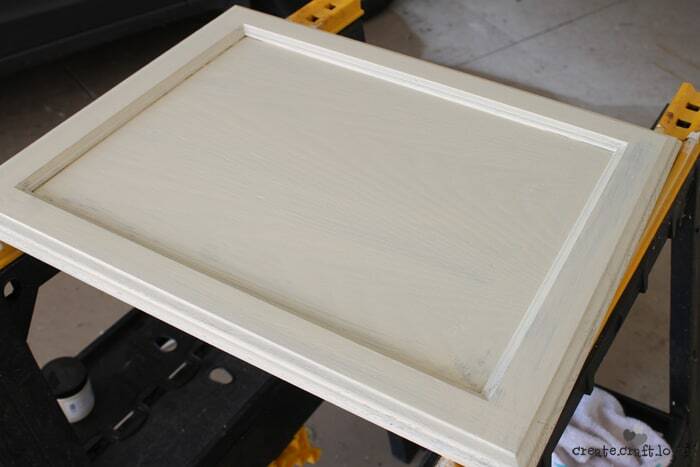 While it is still wet, use a fine grit sand paper to begin distressing the piece. I love how you can see the cream and the wood! After you are satisfied with the level of distressing, apply a new layer of wax. I worked the wax into the paint with a soft cloth. Allow to set overnight. The wax will work as a sealant and will cure within 30 days make the surface waterproof. 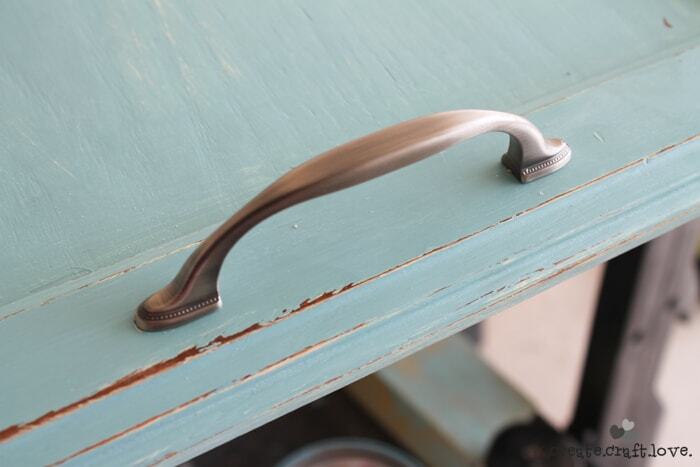 Finally, I added these pretty antique silver drawer pulls. Now, I have a unique piece that pulls together the rest of my decor! I love how the aqua and gray play off each other. 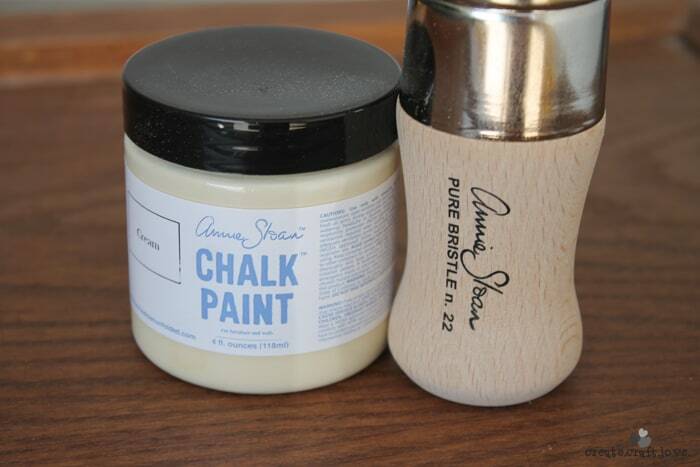 Have you ever used Chalk Paint® decorative paint by Annie Sloan? What did you make? 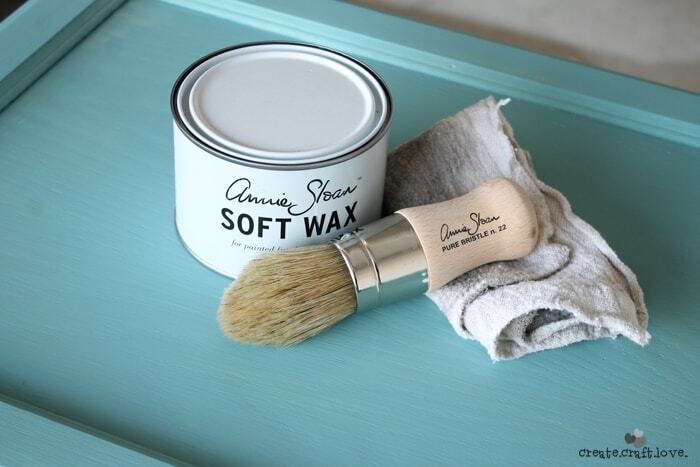 I received free product from Annie Sloan Unfolded for the purpose of this review. For my full disclosure, click here.